Two of the world’s hottest technology start-ups, restaurant search and discovery service Zomato and transportation app developer Uber, have announced a global partnership — and the fruits of it will be seen in South Africa first. The fruits of tie-up are being rolled out to Zomato users in South Africa and the UK for now and will be introduced over time to other markets where both companies have a presence. In terms of the deal, Zomato users will be able to book transportation to the restaurant where they are planning to eat directly inside the app. 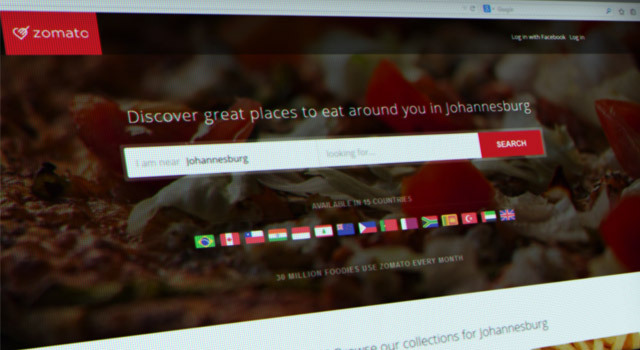 “The feature will initially be available to Zomato users in London, Johannesburg, Cape Town and Durban and will subsequently be rolled out to users in other key markets,” Zomato said in a statement. Zomato, which is headquartered in India, explains that once a user has found a place to dine using its app, a single tap on the Uber button on the restaurant page will allow them to find the nearest Uber taxi. In addition to seeing the estimated fare and how long it will take for the Uber to arrive, users can choose the Uber service that best suits their needs, it says. Zomato operates across 22 countries worldwide. Its core content include scanned restaurant menus, along with photos and user reviews.